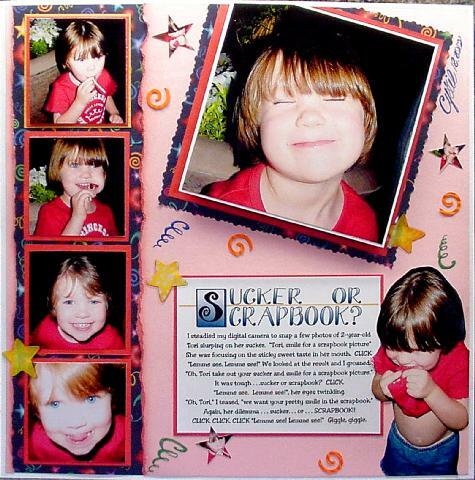 Well, here's proof that when you have great pictures the scrapbook page is EASY to do! I wouldn't have believed it myself. The pictures of Tori trying to decide if she wanted to keep eating her sucker or if she wanted to be cute for a picture for the scrapbook were priceless. This one is nothing more than tearing cardstock and chalking edge. Mount photos onto cardstock and arrange vertically on patterned paper to create a border. I triple matted the large photo for emphasis and used pop dots behind the first mat for dimension. The cropped photo of her giggling was glued directly to the page . . . but with a bit of it trimmed at the edge. The title and journaling were done completely on the computer and printed onto photo paper and matted. I punched a few shapes, added a couple of star stickers, and used some Zig pens for swirly things. Sooo easy, but oh my gosh . . . look how cute!